Sweet Treats charm bracelet. Multiple charms on one bracelet. Cupcakes, Cookies, Donuts, and Ice Cream. Great for Birthdays! Please enter the personalization desired. Letters and numbers available. NEW in 2018! Sweet Treats charm bracelet. Multiple charms on one bracelet. Cupcakes, Cookies, Donuts, and Ice Cream. Great for Birthdays! 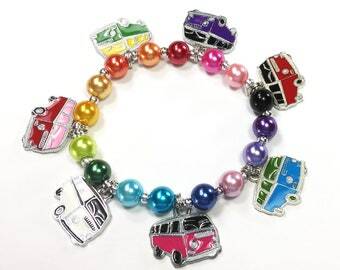 This beautiful bracelet is made with high quality glass pearl beads and 6 clay dessert themed charms. I make my own bead mixes and hand string each order individually with care. You can choose the pearl color that best suits your recipient. Sure to be kept and cherished. Choose from our suggested colors or customize it for the recipient. View our pearl color chart in the 10th picture. You can also choose to have it personalized. be sure to include the personalization desire din the message to seller box at checkout. Upgraded gift packaging also available at the link below. Our standard free packaging is an organza drawstring bag and sparkly tissue paper. So Cute! A light weight, strong, stretchy bracelet for your child. Made to spell out his or her name, sport, or nickname of choice. Accented with beads. Bead color or dye lot may vary slightly from the ones shown. If you would like it made to complement your teams colors or your child's favorite colors please indicate so when contacting me with personalization info. This listing is for ONE bracelet. Photos shown here are examples. If you want more than one bracelet personalized please purchase one item for each. You will automatically receive a shipping discount as long as you checkout and pay all at once. Absolutely adorable! 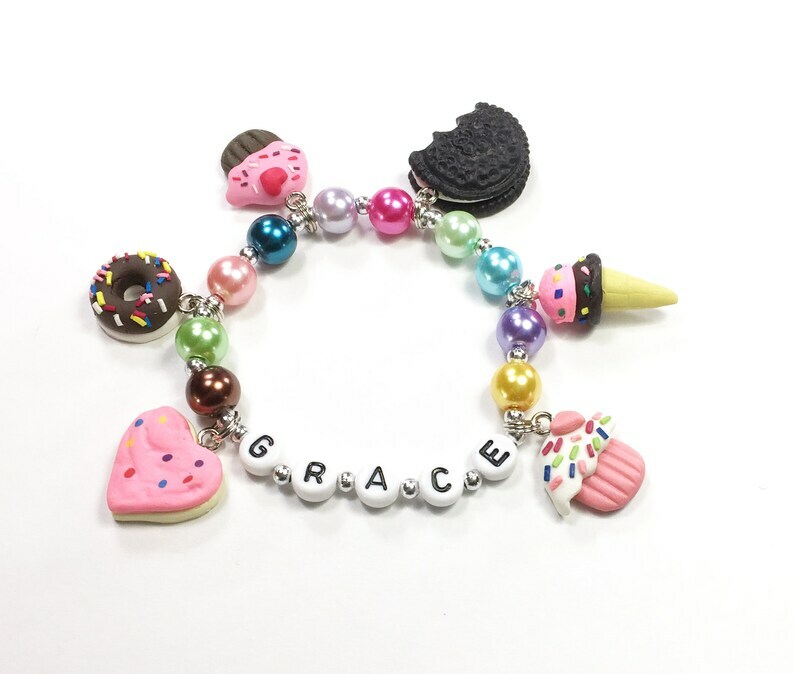 A perfect birthday gift for my sweet granddaughter (sharing treats with Grammi (me) :o) No problem having the bracelet specifically customized. Great "working" with Kristin regarding my special one-of-a-kind order. Fast delivery.